I'm not just randomly saying sister to say sister. Although I could write about my sister. For instance, this blog post could be about how much my sister loves Spanish soap operas. She really does. But I really just plan on sharing my lovely weekend with my sister. The Spanish part was just to make it fun (everything is better in Spanish, or so my sister says). Lindsay arrived late, late Thursday night - the lateness deserves a double late. Her flight was cancelled and she caught the later flight that was then delayed. Cancelled = Late #1, and Delayed = late #2. She finally arrived at 12:30am - that’s 30 minutes into Friday, so I take back the first sentence of this paragraph. Lindsay arrived early, early Friday morning. I still had to work Friday, and Lindsay had to go a conference - the real reason she came to Seattle. 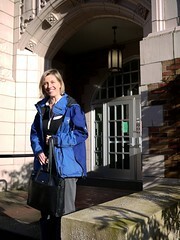 Her conference was at the University of Washington and something to do with history and stuff. (See her coming out of the conference below). But the real fun started Friday evening with a Bella blast. A Bella Bridesmaid blast that is. Yes, the bridesmaid quest begins. We headed to downtown Seattle for some try-on time...my sister was thrilled. Trying on dresses is hard work, so we grabbed some grub afterwards at a placed called Local 360. Josh was at the office that day, so he just meet up with us for dinner. 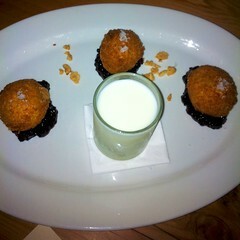 The meal started with some peanut butter and jelly bon boons. Then some more tasty foods to round off the evening. Saturday Josh and I introduced Lindsay to our favorite bakery, and the one my mom always raves about having the best fruit coffee cake, Macrina. 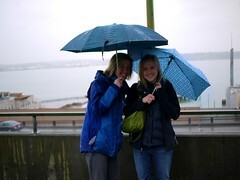 We also introduced Lindsay to Seattle rain. Lots of it - slow, steady, constant rain. No, not that bad, but it sounded good. After coffee and muffins, we headed to Pike Place Market to give Lindsay a taste of Seattle. We showed her the market and some of our favorite shops including the World Spice store. Josh and I stocked up on our favorite chai tea too. We also tried some blueberries from the blueberry guy at the market. In the afternoon, Lindsay had to participate in a lecture so Josh and I roamed around Wallingford. 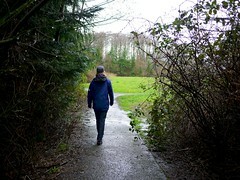 Once the lecture was over, we continued on to Ballard to walk around. The day was finished with Senor Moose (more Spanish). This was the first Mexican restaurant I really enjoyed. Jaws dropping from Lindsay and Josh as I actually enjoyed the Mexican food. Josh was practically giddy about it. Sunday Josh had to say goodbye in the morning to head out on work travels. Boo. But that left us for sister bonding time. Sister time started with more bridesmaid dresses. This time at J. Crew. Again we found some more dress options. Finally, we came to some beach. 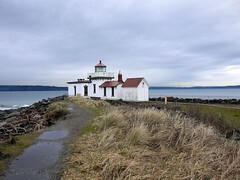 Where there is a beach, there is bound to be a lighthouse. And find it, I mean discover it, we did. And that’s the end of the discover the lighthouse story. We did discover other things too - little birdies, an empty nest, a crow, and some other random things I could mention. 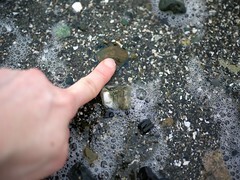 More exciting though.. we touched the Puget Sound. 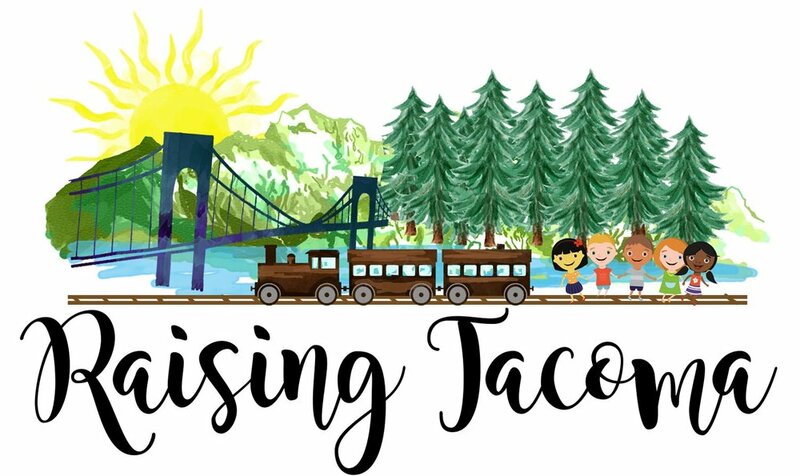 Yes, I’ve lived in Seattle for six months, and never touched the water (besides that which comes from the sky). Sister day ended with some grocery shopping. cooking dinner, and reviewing bridesmaid dresses. Que divertido!